Congrats to collector Dan Brunetti. 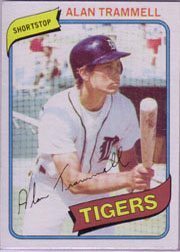 After getting one of the increasing rejections by Alan Trammell (card returned unsigned in the SASE), Dan tried again. Studying the recording attempts and rejections for a problematic signer like Trammell (whose autograph attitudes seem to have taken a U-turn beginning in 2010 as a Cubs coach), can be done easily with a source like www.sportscollectors.net. However, the time comes when you have to make your own game plan. Everyone is different. Time of the year (in- or off-season) may matter, too. Even retirees can be busier in summer. The moral of this story is to keep hope. Don’t risk losing a valuable card from your collection. Yet, figure out a way to stand out from the other requests, and you may be smiling like Dan. Coming Monday: Baseball’s most inspirational broadcaster? Hey, Washington Nationals! Broadcaster Jason Benetti Deserves A Call-Up, Too! I never had any issues with Trammell. His former Tiger teammate, Kirk Gibson, has been pending since Spring Training started.